Congrats to Guindi for the winning entry and 50 duck prize. Thanks to everyone who entered and voted! Here are the final results of the Caption this drawing caption contest. "Thank god no one invited Yellmo to the feast"
"We need to fatten up to survive Black Friday"
"All the memes were invited, too." What is this sharing you speak of? Alright! who invited the seal?! This turkey isn't intuitive enough for seal. Let us all be Thankful for another memey year. Drawception's SEELed the deal! Oh, my! "I'm not gonna get any of the turkey, am I?" Found a whole turkey in the trash this year! Never liked the guy anyway..
D's thanksgiving gets a seal of approval ! A feast of memes and kings. Thanksgiving for the Drawception Community! Next year we should get children meat. Seal wants the D !!! Who are you people and how did you get in?! WELCOME, TO THE FEAST OF THE CENTURY! Drawception "seals" with turkey dinner! Funny seeing you here, its like a de ja vu. My Turkey! Get your own you stupid seal! The D himself, carved the roast beast! Seal: Yeah, keep going, D. I hated that guy. Now how is Red D going to eat this turkey? They're having a feast. But you're next. Deep inside the DC servers on Thanksgiving. Silly humans. Memes also like eating food. Turkey Time With My Pals! A feat of memes and kings. Look! D's plated your plate! Win Thanksgiving Dinner with D, Seal and You! Time To Eat Honest Lives. And so a D gave poultry to a seal. Seal YOU at Thanksgiving with Drawception! A Beautiful Thanksgiving- DrawCeption style! Drawception D cuts a juicy, delicous, turkey. The thanksgiving dinner with The Big D.
D invites guests to dinner. Wait, what dinner? The Evil Drawception D poisoned the turkey! Facebook person, drawception and seal. The D, Anon, & a seal gather for Thanksgiving. Red drawception, anonymous, and rodent FEAST! Logo tries to cut chicken with butter knife. Drawception can't cut a turkey, also a seal. Evil D, Anon, and Seal enjoy Thanksgiving! Seal, Republican D and Generic Avatar Feasting. 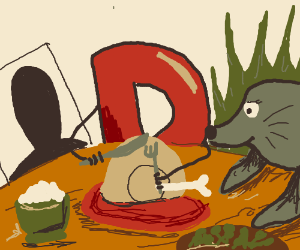 happy thanksgiving, drawception and mole! red "D" eating chicken with a seal and anon.